We are also looking for volunteers to help with this event. If you are interested in helping with set-up (either the night before or the hours before the event), sign-in, game organizing, and/or clean-up, please let me know! Thanks so much!! 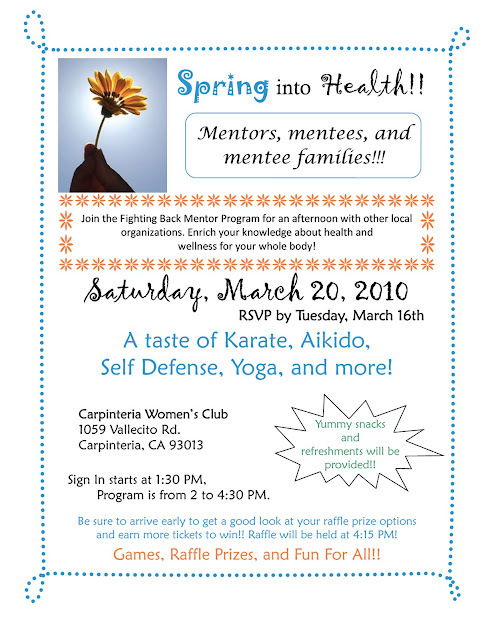 Some prizes include: A new bike, a ride along with the Carpinteria Fire Department, and a Whole Foods gift basket! Come to find out what else is up for winning!! MENTORS: This day would have qualified you for the Disney's Give a Day, Get a Day. Unfortunately, we were just informed a couple of hours ago that that the tickets are gone and they are no longer giving away tickets...Sorry! RSVP by Tuesday, March 16th!! Click the flyer below to enlarge. The kids and mentors all had a great time at the 2/24 game!! Check out the pics below and be sure to join us next time!! Gaucho mascot Olé joined the group for a photo op! Mark G.'s mentee won a free T-shirt!! Tony and his mentee had a great time!! You may not be able to tell, but Mark W.'s mentee loved every minute!! Come out for a night with the Gauchos Men's Basketball vs. Northridge!! Mentees will get to High-Five all the players as they run onto the court and take pictures with the Mascot!! Be sure to arrive with plenty of time to get parking, your tickets, and find a seat! It's sure to be a packed house!! Frank Randall has been a constant encourager and supporter of his mentee over the past 2 years. His mentee lives with his older sister and mother and was referred because he needed a male after which to model his life. He spent much of his time after school sitting at home, bored, and playing video games. When Frank stepped in as his mentor, he saw this as a unique opportunity to help his mentee further develop his sporting skills. Seeing as his mentee's mom didn't have the financial ability to enroll her son in any organized recreational sports, Frank sought out the Boys and Girls Club. The Downtown location was within walking distance of his mentee's home so he knew that if his mentee established connections there, he could go there if he was bored. Frank quickly became involved and would often times meet with his mentee at the Boys & Girls Club. His mentee signed up to volunteer in the kitchen, and found that he could connect with the Chef there and have him as an additional male role model in his life. However, not everything has gone smoothly in their relationship. Last year, Frank's mentee sought out negative attention at his school and home, and showed great apathy towards any disciplinary measures. This didn't deter Frank. Instead, he set boundaries. He explained consequence. He planted the seeds within his mentee's mind that would eventually grow and take shape as his mentee came to realize that his actions were not helpful to anyone involved. Frank continued to encourage attendance at the Boys and Girls Club. He helped enroll him in First Tee and baseball and basketball through the Club. After months of working closely with his mentee, the school and Frank began to notice some change. Minute change, but change nonetheless. His mentee recently received an award for all his help in the kitchen at the Boys Club. In addition, the Club awarded Frank with a Certificate of Appreciation. The Downtown Boys & Girls Club Executive Director, Carolyn Brown, said, "Frank attends everything that [his mentee] is involved in, plus comes to the Club to hang out with [his mentee]. Frank has worked with us one-on-one discussing [his mentee's needs and problems and stays in touch with us constantly to make sure we are all doing our best for [his mentee]." Frank, your mentee is very fortunate to have you as his mentor. Thank you for your outstanding patience, dedication, and service! We are very proud to honor you as our Mentor of the Month! One of “America’s Best Leaders” (US News and World Report) and subject of the recent book Whatever it Takes by New York Times Magazine editor Paul Tough, Geoffrey Canada is the visionary creator of the Harlem Children’s Zone, a pioneering non-profit organization that works to enhance the quality of life for children and families in some of New York City’s most devastated neighborhoods. His unflinching dedication to educating and mentoring impoverished children has brought him national media attention and recognition by President Obama for creating a comprehensive program that can be emulated nationwide. Join us on Tuesday, February 16th from 5:30 to 6:30 PM for an open forum with Laurel Anderson, a specialist in youth development with the Orfalea Foundation, as we discuss a strength based approach to working with at-risk youth. Before we come together, please share with us your challenges and situations with which Laurel can help. Email your questions to me so we can really make this discussion about YOU! We understand that it isn’t always an easy task to work with the youth in our program. We anticipate that they will listen to us, as the mentor, when we tell them not to do something, if the respect is there. However, they are still young, they are still learning. Through that learning, they may slip up from time to time and make mistakes. Is it possible that the way in which we talk with them can affect the outcome? Is it possible to be an adult in their lives who encourages them to make positive choices, without being overbearing? I believe it is possible. It’s called using a strength-based approach, and Laurel will be helping us reframe the way we think and the way we talk with our mentees. Again, please submit your stories and challenges ahead of time if possible. Otherwise, be prepared to share, learn, and leave with a new outlook on the way you work with your mentee! It's that time of year! 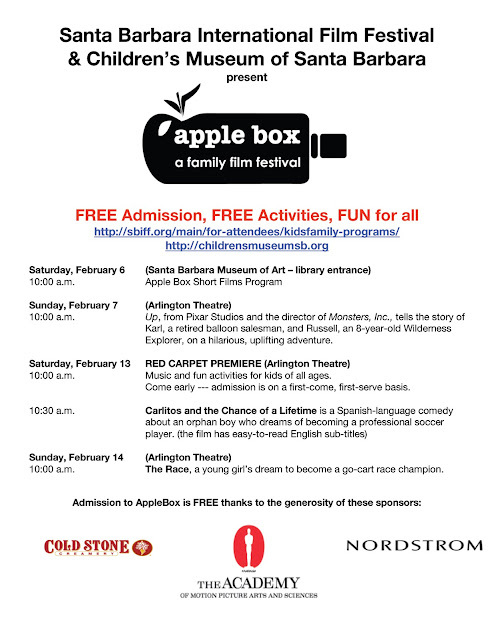 The Santa Barbara International Film Festival is in town and through the efforts of the Santa Barbara Children's Museum, The Academy of Motion Picture Arts and Sciences, Coldstone Creamery, and Nordstrom, there will be presentations of 3 films and a short films segment available to ALL ages for FREE! FREE admission, FREE activities, and FREE popcorn! All events begin at 10 AM, but be sure to arrive early as admission is on a first come, first serve basis. See the flyer below for more details! 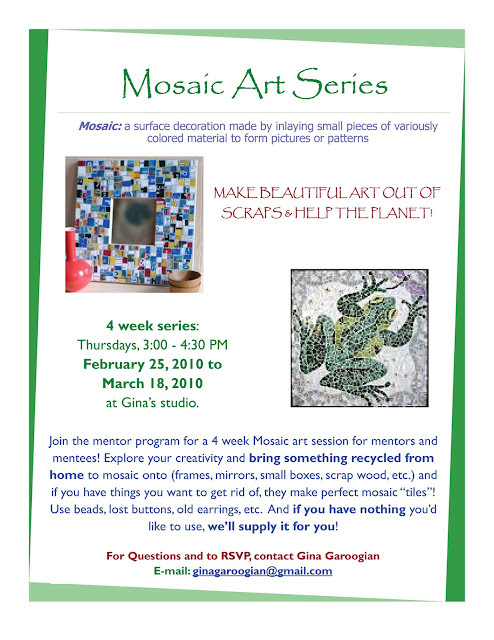 Space is limited to the first 6 mentors and mentees who RSVP to Gina, so act quickly!